We had a major burst of spring cleaning this year. For the first time ever, we are doing a yard sale courtesy of bumming off my sister's neighborhood's annual yard sale. So we have torn apart our whole house clearing out all our old junk. Before long we couldn't help but notice all the old junk in our yard as well -- four years' worth of dead bushes and decayed trees that we had never taken care of. 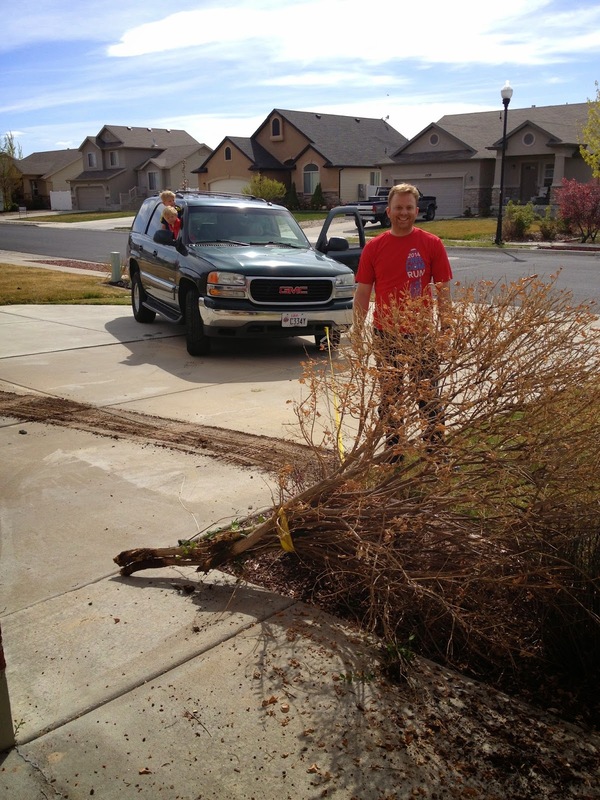 A couple Saturdays ago we ripped out all our dead foliage with the help of our Yukon. 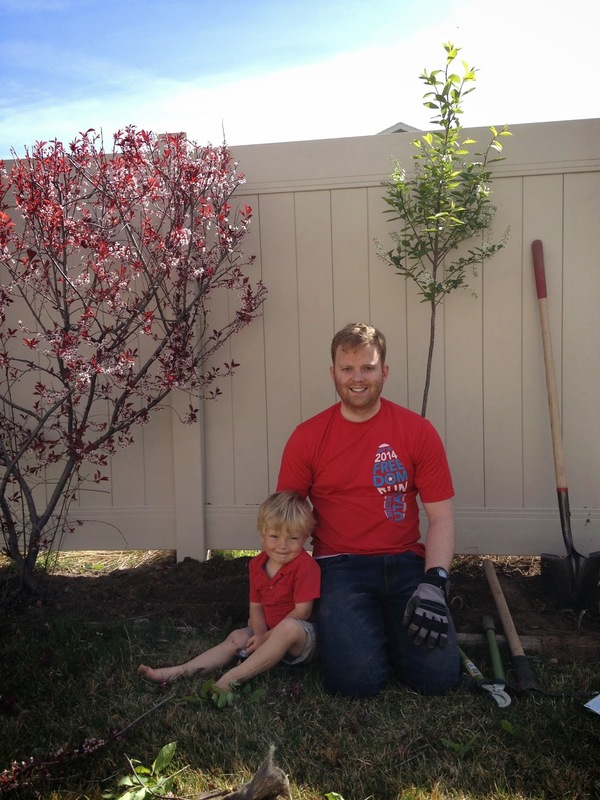 Then we got a few trees to fill in the gaps. Our yard is still a work in progress, but it's looking much more lively and crisp than previous years. These little rascals are troopers when it comes to yard work. They love to help pull weeds and throw sticks into the trash for us. 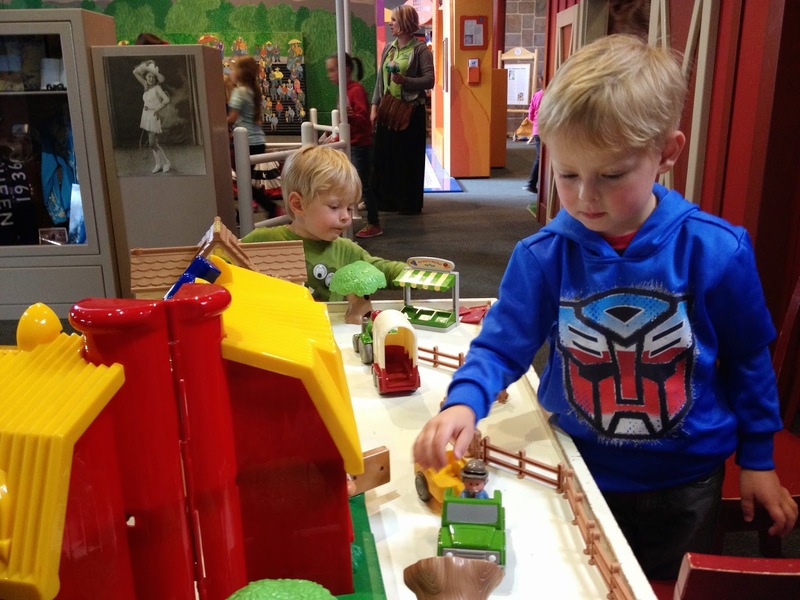 My boys have what's becoming an increasingly unhealthy obsession with Rescue Bots. It is literally the only show they watch and the only "make believe" they play. (I say make believe in quotes because I truly don't think they think they are make believing because this world is so real to them). Thankfully I think Transformers are one of the less annoying kid shows, and I think the concept is pretty clever, so I don't mind accepting them into our family. And I don't mind seeing evidence of their integral part of our lives strategically placed around the house every now and then. Lincoln is an angel baby, you guys. He is so sweet. He rarely cries. He is super mellow. Super smiley. Super chill. He has started sleeping 6-hours for his first chunk of sleep at night. He's getting himself on a schedule. He's molding to my attempts to get him used to falling asleep on his own. He is seriously an angel. On the rare occasion he is fussy for unexplained reasons, all I have to do is flip him on his belly like so and he doesn't let out another peep until he's hungry or tired. Love my sweet boy! 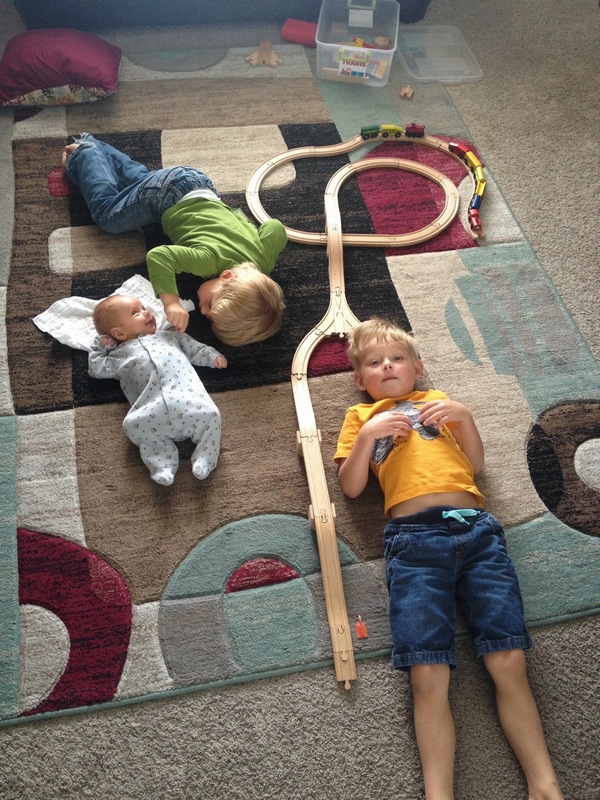 One day Eli made this train track and wanted me to take a picture of it to send to Jeff. Little did I know I would capture this sweet moment between Lincoln and Carson while filling Eli's demands. I was in charge of a Miamaid class activity for mutual. I thought it would be fun to water color our favorite quotes from last General Conference. Seeing as I know...ahem...knew nothing about watercoloring, I practiced the day before with rain drizzling, Lincoln napping and the older boys wrapped up in an episode of Rescue Bots. It was unexpectedly heavenly. I hit my artistic stride with the conditions just perfectly so and quite enjoyed releasing a little artistic energy onto a slab of paper. Two people at church today randomly told me they could just tell Jeff is an awesome dad. Umm. Yeah. He definitely is. I wouldn't have believed dads as good as Jeff existed prior to seeing him with our boys. I'm convinced we have all boys because more boys in the world need an example like him as a father. He's just the best and his loving interactions with the herd we're raising constantly remind me how lucky we all are to have him. 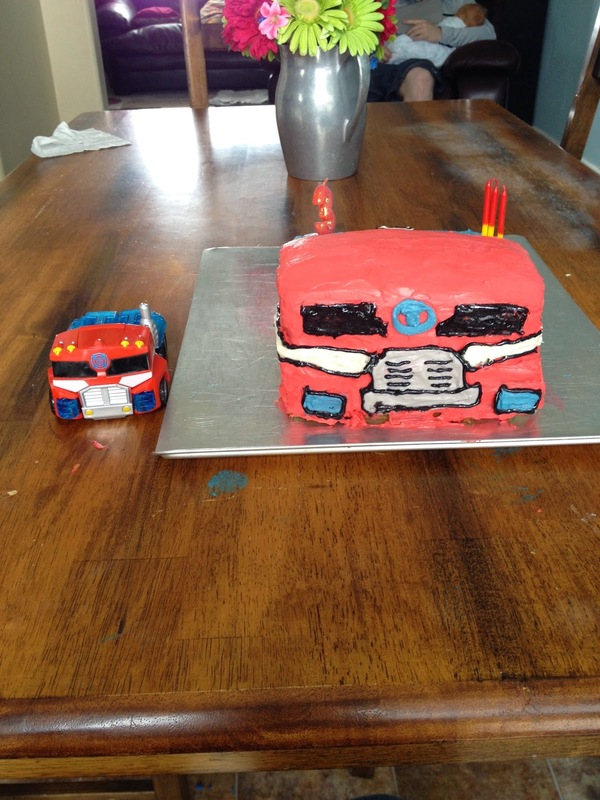 In what I have now deemed as the most artistic week of my life, two days after my watercolor experimenting, I whipped up one of my more artistic birthday cake attempts for my Optimus Prime loving two-year-old's third birthday! 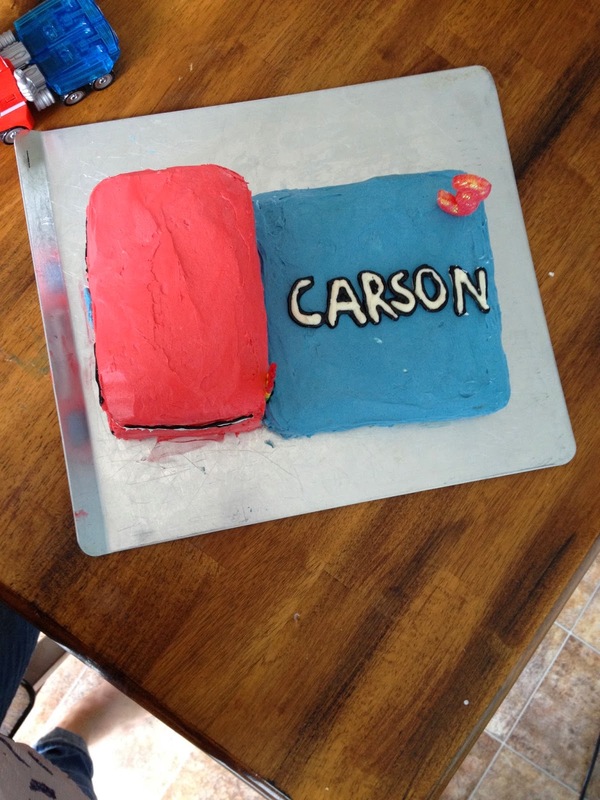 The days leading up to this cake's assembly Carson changed his mind about which Rescue Bot he wanted to see in cake form 4,359,049 times. I knew deep down Optimus is his favorite, so I took a gamble and went with the Optimus cake. He was completely satisfied with the result. I said to him, "CARSON! Is today a special day?!?! What is today?!?!" He said, "Friday?" with some confusion evident in his voice. Ha. He eventually figured out it was Thursday. Aaaaaaand his BIRTHDAY! And then he was super cute and excited. Eli woke up and immediately knew what was going on. 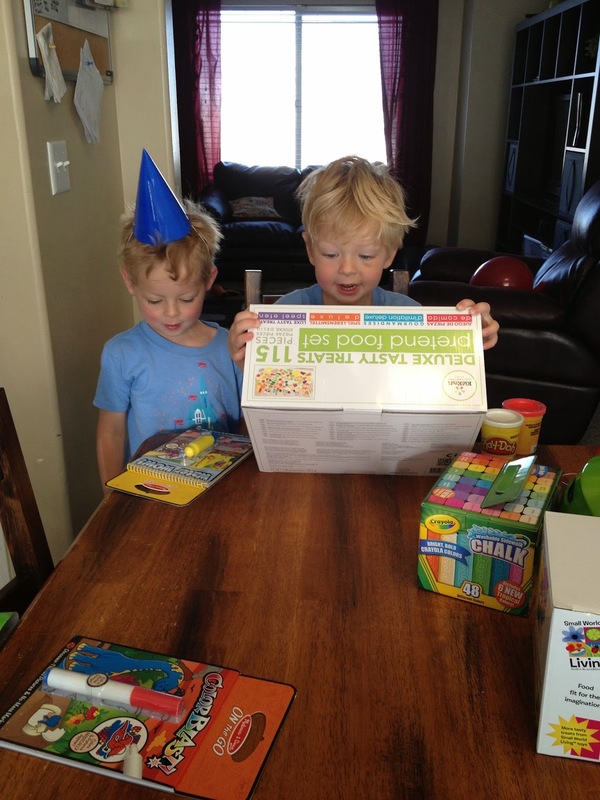 Eli's got the order of all our birthdays memorized and methodically calculated so that he knows when his turn is up. This was just another tick in the line to get him one step closer to his big day. Worth celebrating if you ask him. 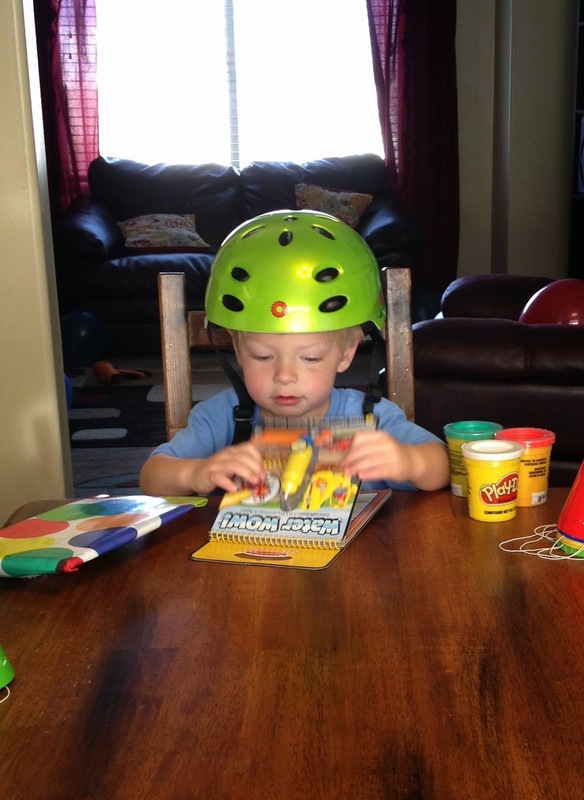 Carson got a helmet, some chalk, some Play-Doh, and some activity books for church. Carson loves to pretend to cook any time I am cooking. He loves food and he loves to help people make food. I got him a bunch of toy food and toy pots and pans as his big gift this year. He seemed to like it! Lincoln was happily a part of the big day as well. I have done little birthday parties for my kids before, but lately I'm into going to do something fun for the kids' birthday. 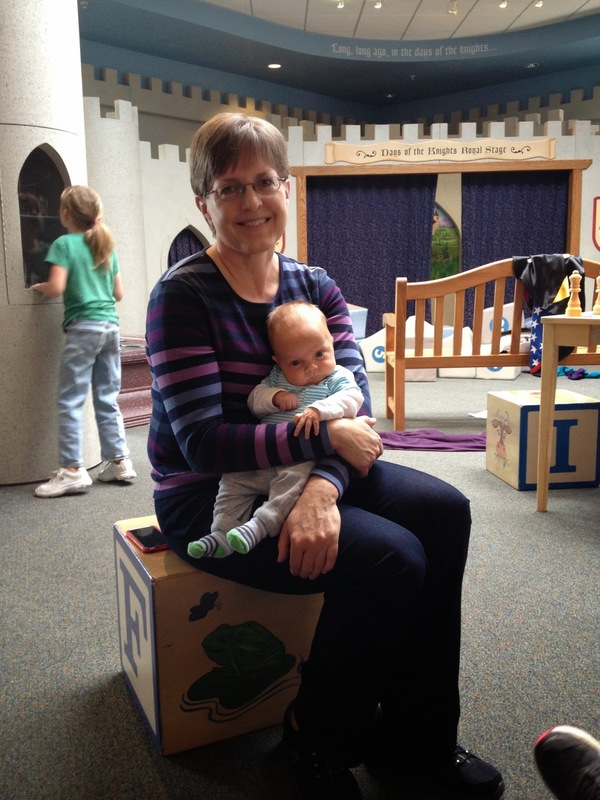 We met up with my mom and sister at The Treehouse to give us something fun to do that day. I love places like this! Eli was finally big enough to run around without me having to worry about where he was every second of the day. And I THOUGHT Carson was old enough to kind of stay with the group and mindful enough to stay relatively near me, but that proved to be an incorrect assumption. Carson was the king of pinging around through all the rooms at lighting speed. He wouldn't stay in one place for more than .21 seconds. And if he did appear to stay somewhere, he would make his move to the next location just as I turned my head, so I was constantly losing him. He hadn't gotten himself in too much trouble in the brief moments I lost track of him, so by the end of the day I was less nervous to find him out of sight. Just after this picture was taken, he vanished, but I thought he was behind one of those walls in the background. 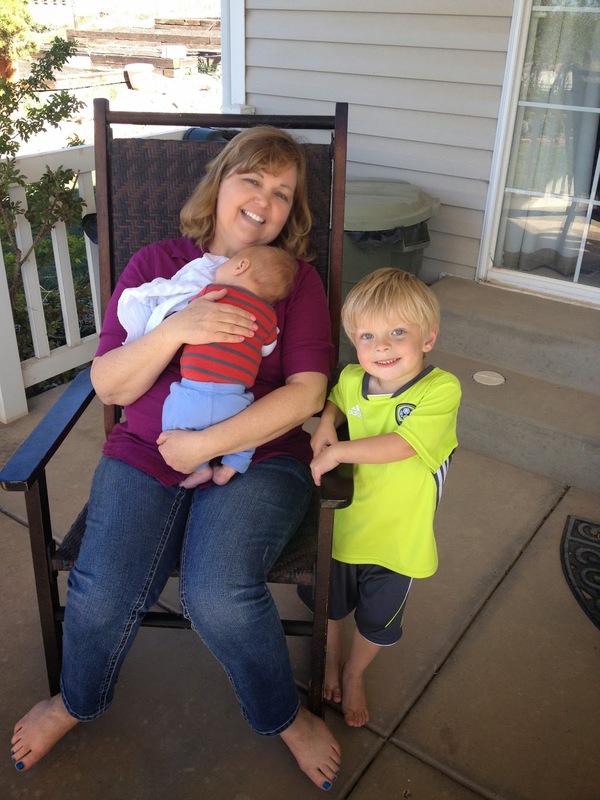 My mom, sister and I started chatting about plans for Lincoln's baby blessing when I realized it had been a while (5 minutes or so) since I had seen Carson. With my senses piqued at the thought of Carson missing, I was suddenly able to hone in on a distant cry that sounded all too familiar. I looked over the edge, and saw Carson halfway out the front door, screaming, with three employees surrounding him. Somehow he had walked right past me, my mom and my sister, down the stairs, past all the exhibits downstairs, straight out the front door in a matter of minutes. I ran down to rescue him and the employees said he got his arm stuck in the door on the way out. Not sure if they would have stopped him had his arm not been caught...so I was glad the door provided some sort of security to prevent the jail break. What's hilarious is Jeff was across the street at the temple while we were at the museum. He said as he walked out of the temple he could have sworn he heard Carson crying, but thought it had to be in his head. When we figured out the timeline, he definitely DID hear Carson crying. It was slightly reassuring to know had Carson managed to break free, Jeff would have been right there to find him wandering the streets of Ogden. Ha. We went back home and had Carson's favorite dinner -- potstickers, rice and broccoli. 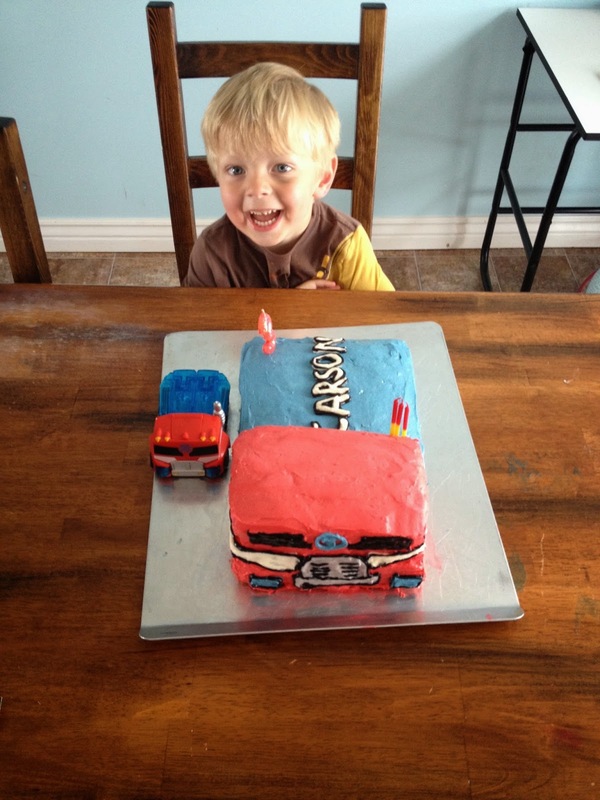 Then we fired up the Optimus Prime cake. We went down to Cedar City a couple days later. 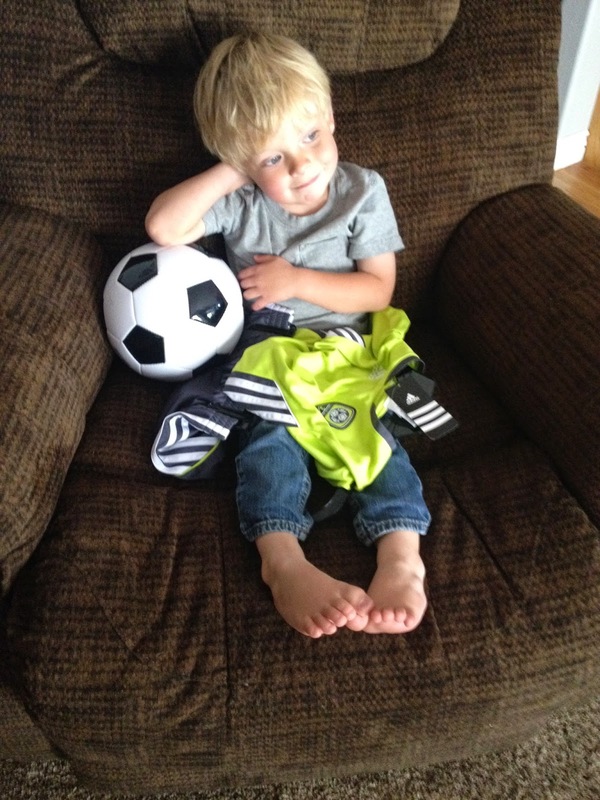 Mary gave Carson a soccer ball and a little soccer outfit so Carson could get into the world of soccer with Eli's latest interest. 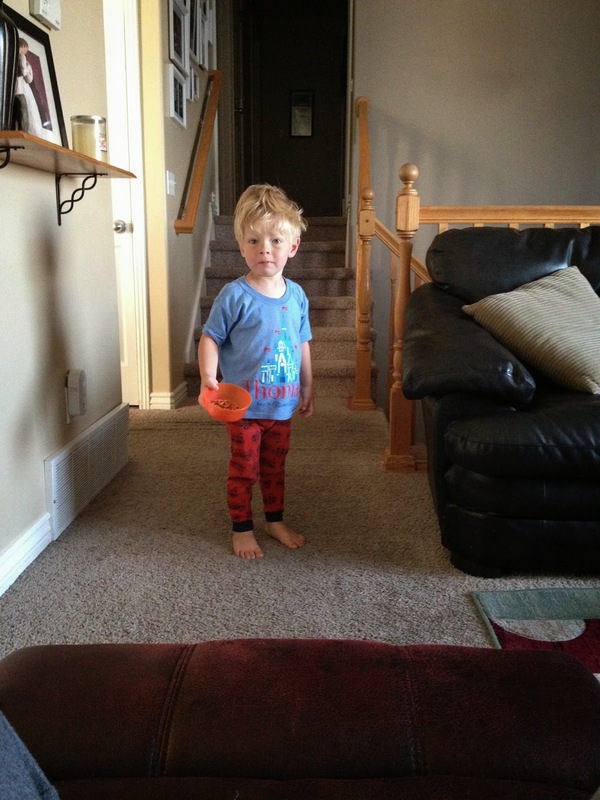 Carson looked super cute decked out in his new attire! 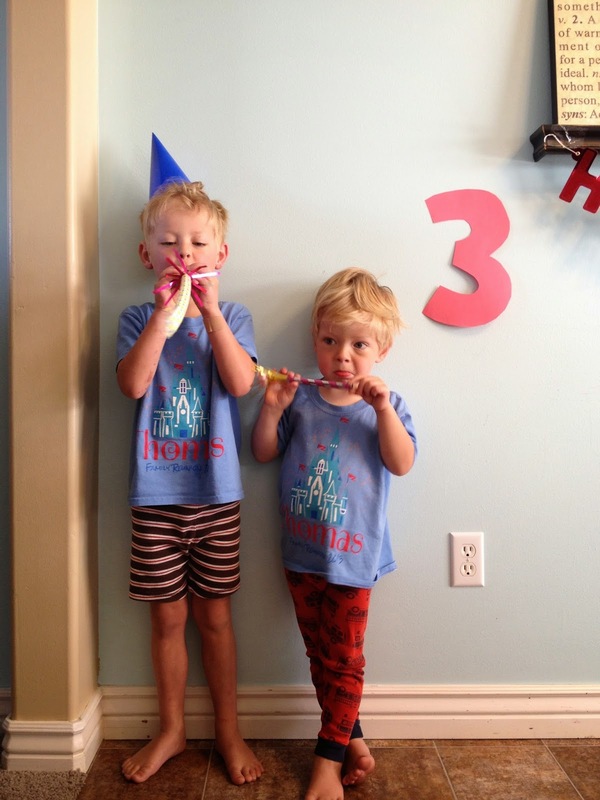 Happy Birthday to our spunky three-year old! Carson loves people. He has no fear or boundaries when it comes to interacting with people he does or doesn't know. I envy that about him! 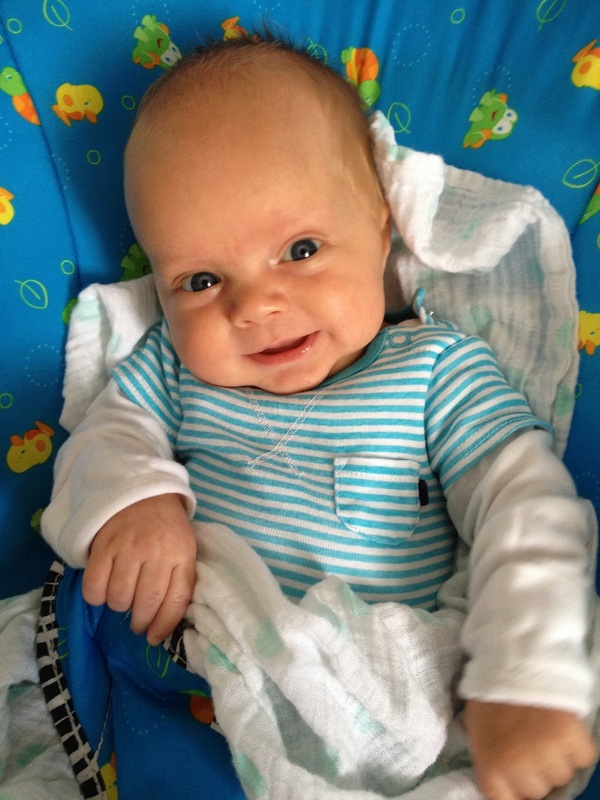 He thrives on attention and loves to get a good laugh out of people. He never takes things too seriously which helps me remember to have fun. 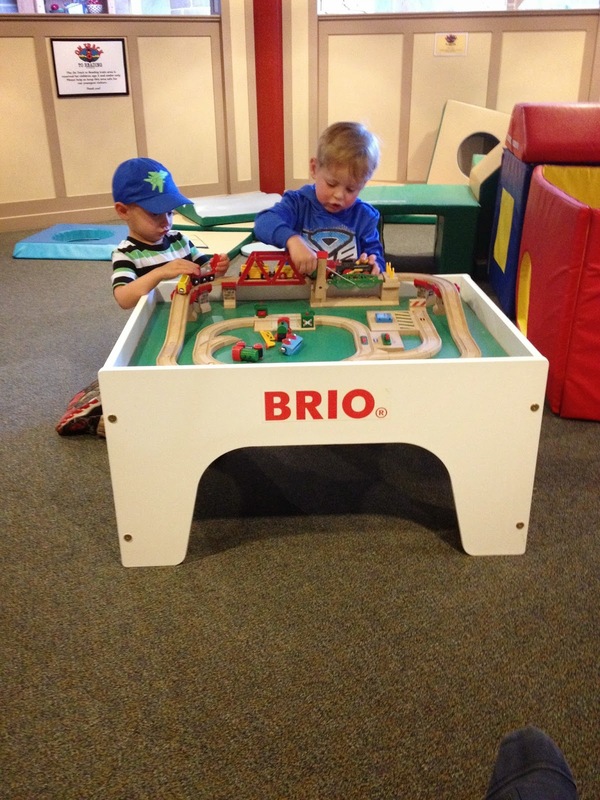 He adores Eli and tries to do everything just like his big brother. He is constantly cracking us up with his toy preferences. He loves to find unlikely toy pairings. For example one day he rummaged through the pantry and found a can of chicken broth and a measuring cup and possessively walked around for a whole week hoarding a can of chicken broth that perfectly fit inside a measuring cup. He loves things that fit inside each other that don't necessarily go together. He is really smart with his words. He loves to change one or two letters of words. Like he'll say, "Hi Bommy, I'm Barson!" And then he'll go around the house reciting what he sees but making everything start with the letter "B." He also sounds out each letter in words when he gets bored, which has impressed me that he can identify all the sounds. He'll go, "I-i-i-i-i w-w-w-a-a-n-n-n-n-t-t-t-t-t w-w-w-a-a-a-t-t-t-e-e-e-e-e-e-e-r-r." annunciating each individual letter several times before moving onto the next letter in the word. He still gets mildly abusive when he is bored. Usually Eli gives him the attention he needs, but when Eli's gone or ignoring him, he goes throwing his head into people or walls to get people to notice him. Ha. That kid. We've taken a step back on potty training. We never had much success with #2, and we were starting to have some annoying issues, so I just decided to give up on it all together even though he was completely trained otherwise. I'm swallowing my pride and letting him come to me to let me know when he's ready to be potty trained because Carson is not one that does well with being pushed into things before he's made up his mind that that's what he's going to do. So we wait. "BAD BOY MOMMY!" When I'm doing something he doesn't approve of like trying to change his diaper. "What that smell?" He asks this a trillion times a day. He has the nose of...something with a really good nose. No smell gets by him without his noticing it and drawing attention to it. "I LOVE YOU SO MUCH!" Said every night as Jeff leaves the room after putting the boys to bed. Jeff says, "I love you." and walks out. Then Carson will scream this at Jeff as he's walking down the hall over and over again until Jeff echoes it back to him. It's become a cute nightly ritual that leaves everyone with a smile at the end of some hectic days. "Are you cooking dinner?" Anytime anyone is in the kitchen, any time of day, they will be asked this question. If the answer is "Yes," the next sound in the house is a chair being scraped across the kitchen floor to the counter so Carson can help with the meal prep. Whew. 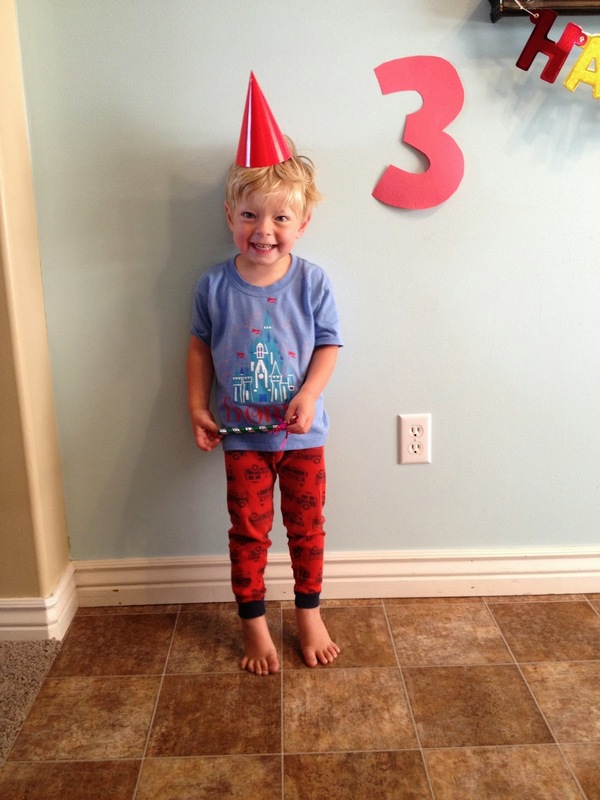 There's Carson's three-year update. He is a joy. He is a terror. He is a sweetheart. He is a maniac. 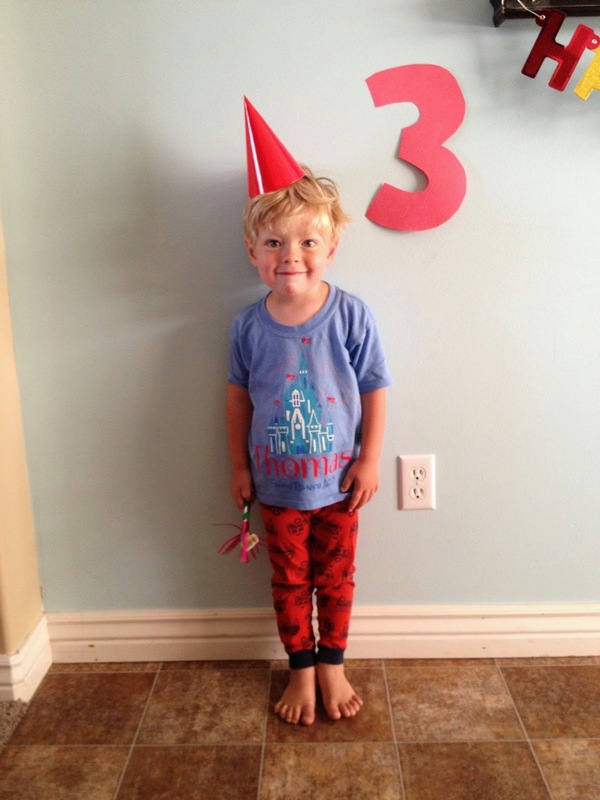 He's everything you'd expect from a three-year old and he's so much more than you'd expect from a three-year old. I love that kid and I'm glad he's ours! Cute post. I loved hearing all about Carson's shenanigans. I enjoyed your clever title as well. Love the picture of Carson and Jeff in red. 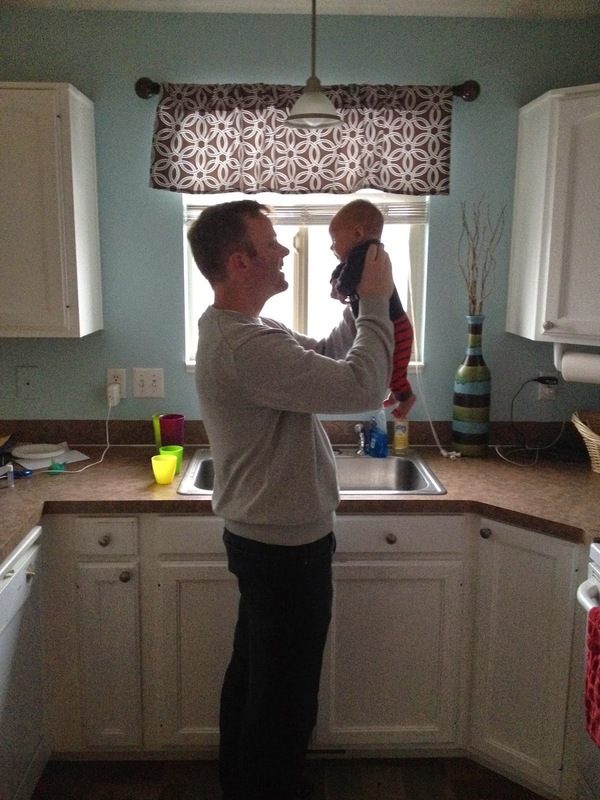 Also the one of Jeff holding up Lincoln in the kitchen. Jeff is such a great daddy. 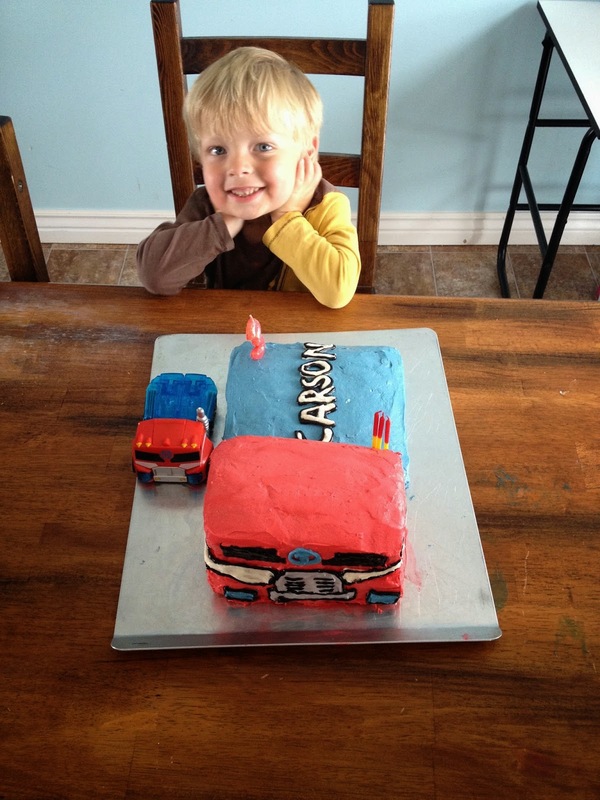 This was a great post with lots of great pictures capturing Carson in all his Carson glory. Loved it!! Love him!! I am glad Carson had such a fun birthday. He is such a cute boy.